We are a Wiccan coven in the Tradition of the Assembly of the Sacred Wheel. To find out more about our Tradition click on the logo below. Jim Welch, RN HNC was formerly High Priest of Keepers of the Holly Chalice, the founding coven of the Assembly of the Sacred Wheel. 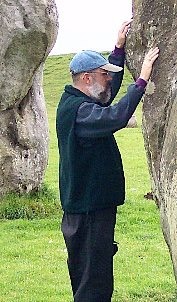 He has been active in the Wiccan/Pagan community since 1981. He was the chair of the committee that wrote the Assembly of the Sacred Wheel's code of ethics. He teaches a variety of workshops that focus on ethics. He is a Waterpourer and conducts Sweat ceremonies using Wiccan protocols. Jim practices a variety of forms of healing touch and healing ritual and is certified in Holistic Nursing. One of his great loves is music and he has taught many chant workshops and directed the music for the chant CD “A Dream Whose Time Is Coming”. Jim is one of the stewards of Seelie Court, 102 acres of wooded land in Southern Delaware that is also the future home of the New Alexandrian Library. The Assembly of the Sacred Wheel is a legally recognized Wiccan non-profit religious organization based in the Mid-Atlantic region. Keepers of the Holly Chalice, the founding coven of the Assembly began its life in February of 1984. The Assembly was incorporated in the state of Delaware in 1993 and was granted 501(c)(3) status by the IRS in 1995. The form of Wicca that the Assembly practices is syncretic and draws inspiration from Astrology, Qabala, the Western Magickal Tradition and the folk religions of Europe. Religiously, the Assembly is dedicated to the health of Mother Earth, and to all of her children. We recognize that every human carries the divine spark of God and Goddess, a gift that carries the obligation to make manifest this divine heritage. Divinity itself, source of the Universe, is a single and incomprehensible force that emanates as the God and the Goddess. God and Goddess reveal themselves to us in the threefold aspect of Maiden-Mother-Crone and Youth-Father-Sage. Divinity is immanent, inherent in all that exists and transcendent, supporting all that exists - whole, distinct, incorruptible, and outside of time. Between human beings and the ultimate Divine exists a vast ecology of disembodied, or un-embodied, spiritual entities which we work with in order to promote growth and earthly harmony. When working with these entities — which include the Elements, Faeries, and Ancestors — we invite them, rather than command them, to join us. This is in keeping with the doctrine of Free Will, which we believe must equally extend to all spirits — human or otherwise.